Patience, kids; it's a virtue. Night Vipers stalk their prey in the dead of night. They specialize in nighttime fighting and blend into the shadows until it's time to strike. They use high-tech night-vision optics to see clearly in no-light conditions, and they can hit their target even in total darkness. 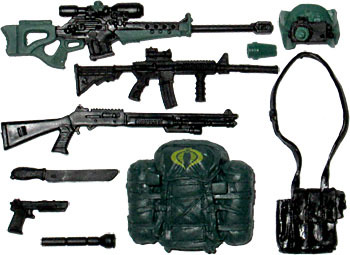 The Night-Viper is part of the end of the Retaliation toyline, in one of the phantom series. Between HasbroToyShop and various discount retailers and, yes, even Toys Я Us itself, most of those figures have been (relatively) easy to get. Most of them. The one exception has been the Night-Viper, which must have been shortpacked, because it always seemed to be out of stock, and commanded consistently high prices online. But I kept checking the pegs every time I saw any Joes, and at last, that diligence paid off. We already had a Generation 3 update of the Night-Viper, in the form of the Pursuit of Cobra Jungle-Viper. 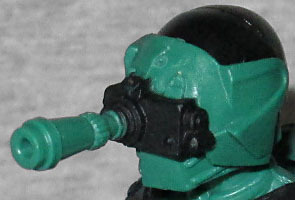 Yes, it had a lot of differences, but the spirit of the figure was the same: a green sniper with a totally ridiculous telescope sticking out of his face. So we didn't really need another update just to give it the proper name, but if Hasbro was going to make one, who are we to complain? The original Night-Viper was molded wearing his distinct helmet, and just had the pivoting visor attach to that. On this one, the visor still hinges up (and the eyepiece can be removed), but the entire helmet is a separate piece. The head underneath is the same one the Jungle-Viper sported, but this one looks different because it has pupils. Considering that the entire body is made from shared parts, it's impressive how much he looks like the original and the G2 DTC designs. The torso comes from the Cobra Shock Trooper, because of course it does. The armored shins are owed to the Night Creeper, while the rest of the leg (including the feet) was originally seen on Skydive. His webgear belonged to the MARS Industries Officer from the first movie, because the strap running diagonally across the chest is similar to the sculpt on the 1989 version. 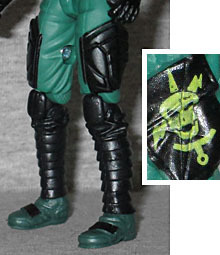 There's a yellow Cobra symbol on his chest, and a patch on his arm that features a skull(? ), lightning bolt, and dagger. In addition to the new three-piece helmet, he comes with a lot of cool stuff. There's a sniper rifle, a shotgun, a flashlight, pistol, machine gun and machete, an ammo satchel and a backpack. It's all nice stuff, but does have a few problems. For instance, you get the satchel, but no ammo to put in it; there's a notch in the backpack, but no pole; and the holster on the webgear was designed for one of those Rise of Cobra pulse guns, so the normal pistol doesn't fit too well. But look on the bright side: you can store the flashlight in the bag, and stick the shotgun in the backpack! The pistol you'll just have to be careful with. The Night-Viper is a decent figure, both in its own right and as an update of a classic design. But he's a decent figure at retail prices, not at secondary market prices. I'm elated that I managed to get him off the shelf, instead of off the web, because otherwise I might really be disappointed.